Port Products' Under Eye Recovery Gel | Valet. Here's the thing about anti-aging products: don't think of them as corrective treatments for old dudes trying to look 22 again. You want to think of them as preventative products that can combat all the stress we put ourselves under—the kind of conditions that make skin look tired, dull and puffy. Which is perhaps why more men than ever are looking for products to tackle the damage done by stress, poor sleep habits or a few too many drinks the night before. Matt and Madison Ruggieri, the siblings behind The Motley and one of our go-to grooming brands, Port Products, know this. They surveyed more than 30,000 of their customers and analyzed sales data to determine that men are not only buying more advanced, anti-aging solutions, but that it's the category their customers are by far most interested in—more than shaving and hair styling. Have you heard some people store eye cream in the fridge? We asked about that. "The cool temperature really does help reduce eye puffiness," says Madison. "While you don't need to store your eye gel in the fridge for it to work effectively, it's a nice boost when you've had a particularly rough night." So they spent two and a half years developing Port Products' first anti-aging product, the Under Eye Recovery Gel. "It was definitely the most extensive R&D project we've done," Madison tells us. "We did extensive research which led us to the marine botanicals and we also provided lab samples to a test group, using their feedback to create the most effective under eye formula possible." What's more, there's no scary stuff lurking in the tube. "I think that's my favorite thing about it—the formulas are super effective and yet super natural," says Matt. 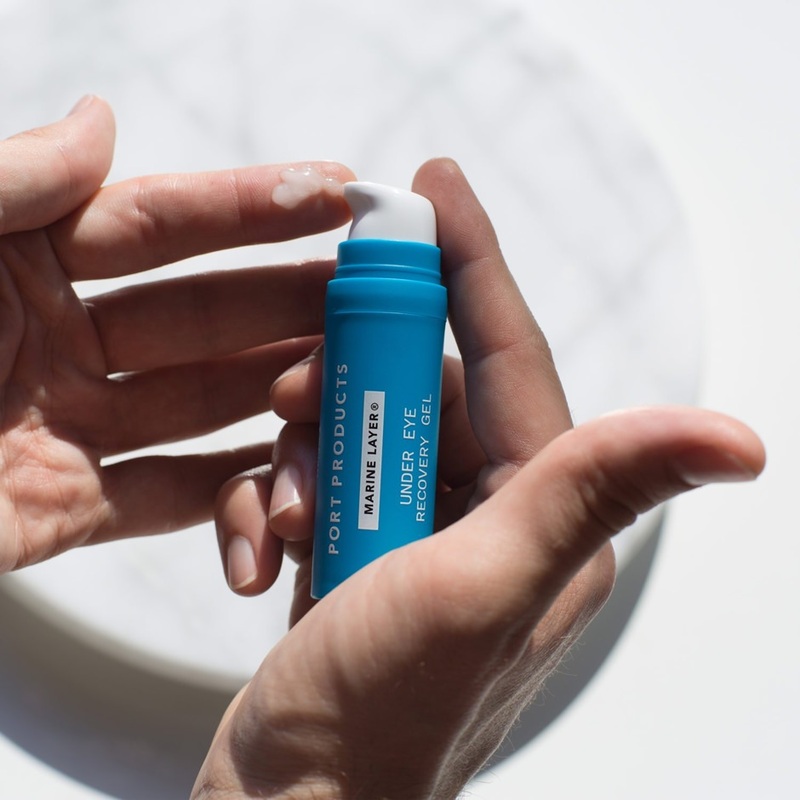 "So many products for men currently on the market have nasty ingredients to make them feel like they're doing something, but we utilized sustainably harvested red algae, kelp and other micro-algaes that are super potent and effective without all the junk." The result? A genuinely impressive gel that works both in the moment and the long run—instantly improving your looks while reversing long-term damage from such skin stressors as sun, smog and fatigue. Want a better version of yourself staring back at you in the mirror? Slather a little of this on every morning and again before bed. In as little as 28 days, the Under Eye Recovery Gel was proven to reduce dark circles and under eye puffiness. So there you go, if you add one thing to your grooming routine, let it be a little tube of eye gel that ensures that no one ever questions how much sleep you got last night. Have you heard some people store eye cream in the fridge? We asked about that. "The cool temperature really does help reduce eye puffiness," says Madison. "While you don't need to store your eye gel in the fridge for it to work effectively, it's a nice boost when you've had a particularly rough night." The common (but nasty) habits that result in pimples. Weatherproof your body while softening and firming your skin.